It is replaced by the Honeywell Dolphin 9951. 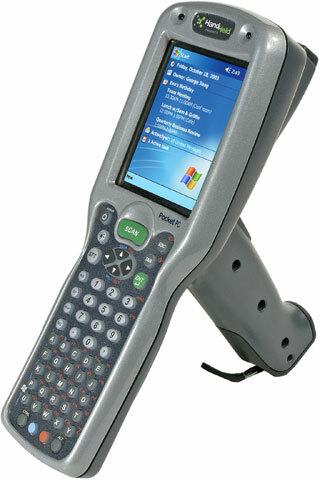 The Dolphin 9551 mobile computer delivers unparalleled performance and value for all mobile data collection applications. Featuring a comfortable pistol-grip and an integrated laser scan engine, the Dolphin 9551 is useful for long-range scanning for long periods of time. The Dolphin 9551's lightweight, ergonomic, and rugged design provides the ease of use and operational reliability needed to excel in robust mobile applications such as package delivery, field service, route accounting, transportation, warehousing, retail, and industrial/manufacturing. Pocket PC, 64MB RAM, wireless, 56 key keypad, 3.5" 1/4 VGA color display with industrial-grade touch panel display, Intel X-Scale PXA255 400 MHz. Includes Lithium Ion Battery, 32MB Flash, ALR Laser. Order cradle, cable, & power supply separately. See accessories. Pocket PC, 64MB RAM, wireless, 56 key keypad, 3.5" 1/4 VGA color display with industrial-grade touch panel display, Intel X-Scale PXA255 400 MHz. Includes Lithium Ion Battery, 32 MB Flash, Long Range Scanner. Order cradle, cable, & power supply separately. See accessories. Pocket PC, 64MB RAM, wireless, 56 key keypad, 3.5" 1/4 VGA color display with industrial-grade touch panel display, Intel X-Scale PXA255 400 MHz. Includes Lithium Ion Battery, 32MB Flash, HP Laser. Order cradle, cable, & power supply separately. See accessories. Pocket PC, 64MB RAM, wireless, 43 key keypad, 3.5" 1/4 VGA color display with industrial-grade touch panel display, Intel X-Scale PXA255 400 MHz. Includes Lithium Ion Battery, 32MB Flash, ALR Laser, Bluetooth. Order cradle, cable, & power supply separately. See accessories. Pocket PC, 64MB RAM, wireless, 56 key keypad, 3.5" 1/4 VGA color display with industrial-grade touch panel display, Intel X-Scale PXA255 400 MHz. Includes Lithium Ion Battery, 32MB Flash, Long Range Laser, Bluetooth. Order cradle, cable, & power supply separately. See accessories. Pocket PC, 64MB RAM, wireless, 35 key keypad, 3.5" 1/4 VGA color display with industrial-grade touch panel display, Intel X-Scale PXA255 400 MHz. Includes Lithium Ion Battery, 32MB Flash, Long Range Laser, Bluetooth. Order cradle, cable, & power supply separately. See accessories. Pocket PC, 64MB RAM, wireless, 56 key keypad, 3.5" 1/4 VGA color display with industrial-grade touch panel display, Intel X-Scale PXA255 400 MHz. Includes Lithium Ion Battery, 32MB Flash, ALR Laser, Terminal Emulation WNVT 100/200 Direct Connect Client. Order cradle, cable, & power supply separately. See accessories.